Sometimes it takes a while to decide that you’re going to buy something that you’ve seen online or that someone has recommended. Once that decision has been made, especially if it’s an electric pressure cooker, you find that there are multiple options to choose from so you need someone to narrow down the choices. We will be reviewing our choice of the Best Electric Pressure Cooker (2018) so that you can see what’s available and choose the best pressure cooker for you. We’ve broken it down into different categories, starting with our overall winner. We’ve tried to break it down into specific types of pressure cooker you might be looking for. Check out the Instant Pot Duo if you’re looking for a good family pressure cooker with a stainless steel inner pot. In an electric pressure cooker you can have many features. Some pressure cookers also have the slow cooking function, steaming and searing. Some cookers can do even more like baking and deep frying. There are delay timing options, pre-set timing options, press button and dial. You need to decide what features are important to you. We have looked at the control panels to see how easy it is to use, the lids to see how easy they are to put on and set to pressure. If an item is simple to use you will use it more often. We look at what accessories are included with the pressure cooker and what is available to buy separately. When you need spares you want to be able to get them easily. The Instant Pot Duo pressure cooker ticks all the boxes when you are looking for a pressure cooker. It looks good in your kitchen which is important because you will use it often. The best part about an electric pressure cooker is the fact that you don’t need to monitor the heat to make sure that the pressure stays steady because the cooker will do all of that itself. It’s much quieter to use and with a simple pressure control on the lid which you turn to pressure when you’re ready to cook and release when you want to release the steam after cooking. The lid and handles are designed so that you can slot the lid into the handle so that you don’t need to find a safe place to put it while you deal with the food inside. You can cook at high and low pressures, slow cook with 3 heat settings and it has a keep warm setting too. You can steam your food, cook rice and porridge and sear your food in the pot before you slow cook or pressure cook. The Instant Pot Cookers have a 10 proven safety measures so that you can feel safe when using while you’re in the kitchen or if you are out with the delay time set so that your food is ready when you come in from work. The digital control panel on the front of the pressure cooker is well laid out and easy to navigate. You can cook whatever you want at the touch of a button with pre-set times automatically installed although you can set it manually if you know what time you want to cook your food. The pressure cooker is mainly stainless steel including the cooking pot. No worries about non stick coatings scraping off, it’s long lasting and easy to clean. The other accessories include are a long handled steam rack for easy removal when it’s hot, a rice paddle, soup spoon and measuring cup which you can use when making rice. The price is not the cheapest but not the most expensive either and well worth the features offered. The Cosori 2 litre pressure cooker is a great size if you’re just looking for a small pressure cooker for 1 or 2 people and if you only have a small kitchen and you want something that will be easy to store then this will be good for you. The first thing you notice on this pressure cooker is the buttons in the lid handle, these buttons allow you to close the pressure valve and open it without having to put your hands anywhere near it, making sure you can’t get caught by the steam releasing out of the valve. The lid is attached to the hinged handle on the base so you can easily open without having to find a place to put it but it can easily slide off the hinge for cleaning. Although this is small it still has the same features as larger versions. You can pressure cook, slow cook, saute, steam and keep warm your food. There is a 2 litre inner pot, made from stainless steel which makes it easy to clean. There is digital control panel on the front which is simple to understand with pre-set options available. If you’re worried about the safety of such a small pot then don’t be it has 9 proven safety mechanisms so no matter if you are a beginner you can’t go wrong with it. This pressure cooker comes with a steam tray, ladle, spoon, measuring cup and a spare sealing gasket. There is also a glass lid included that you can put on when using the slow cooker so that you can see the progress off the cooking. Check out our full review here. The VonShef 8-in-1 Pressure Cooker is currently the cheapest option we have reviewed. If you are looking for a full size pressure cooker at a low cost then this might suit your purpose. It’s a 6 litre capacity which is big enough to cook for a family. This is a more basic pressure cooker and it doesn’t have a slow cooker function. The pressure valve is situated in the lid and has 2 positions which you move to pressure cook or pressure release. There is the standard safety standards installed which apply to all pressure cookers where you can’t remove the lid while it’s still under pressure. The inner pot has a non-stick lining making it easy to clean out. There is an easy to read control panel on the front of the pressure cooker which gives you press button control and some pre-set times depending on what you want to cook. There is a manual function as well if you just want set a known time. The led panel on the front gives you a countdown of the pressure cooking time once it has come to pressure. 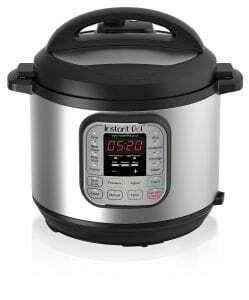 If you’re looking for a basic pressure cooker so that you can cook your stews or soups quicker, or if you want to cook a joint of meat or a chicken then this cooker is worth checking out. Check out the full review here. If you’re looking for a pressure cooker that is easy to use then you need to review the Sage by Heston Blumenthal the Fast Slow Cooker Pro. This is a great looking pressure cooker that won’t look out of place in any kitchen. This pressure cooker was designed to the requirements of the chef Heston Blumenthal and it has very easy controls.With this cooker you can pressure cook, slow cook, steam, reduce, sauté and sear. All you need to decide is how you want to cook and what ingredients you want to cook and select it on the dial. There are lots of different choices of foods with pre-set times programmed into it. Once you choose what your’e cooking the pressure cooker will decide the cooking pressure and the speed of pressure release which will happen automatically at the end of cooking. There is a manual option if you know your cooking times. You have 6 Litre capacity with a non-stick inner pot, the lid is hinged and is sealed with a twist lock action. The pressure valve is on the lid and there is a hands free release button on the front so you don’t have to put your hands near the steam. The pressure cooker comes with a stainless-steel trivet with handles for raising food out of the water. If you looking for a pressure cooker that can lead you by the hand then check this Fast Slow Pro out. The Charles Jacobs Pressure Cooker is a large 8 litre size. If you’re looking for a large pressure cooker that isn’t too expensive then this is the one to look at. This is 13 inches tall and 15 inches across and has the same functionality as most of the other pressure cookers. You can pressure cook, slow cook, sear, rice cook and keep warm and you have quite a choice of pre-set options using the buttons on the digital front panel. The lid has a twist lock function with the pressure valve incorporated at the top of the handle. To set the cooker to pressure cook its an easy action to slide the lever on the valve to pressure and slide it to open to release the pressure when the cooking is completed. This pressure cooker has an 8 litre inner pot which has a non-stick coating. There is a steam rack included which you can use to stand your meat or chicken on if you want to use your pressure cooker to cook meat. If you have a large family or you want to batch cook this could be the perfect size for you, although you don’t have to use the whole capacity if you don’t want to. Read our full review here. The Pressure King Pro 6 Litre 20-in-1 Digital Electric Pressure Cooker has lots of features and if you are looking for a pressure cooker that can manage different cooking methods this is definitely worth looking into. It’s a 20-in-1 so offers a few more features than the normal pressure cooker. You can still obviously pressure cook, you can also slow cook and steam, in this cooker you can fry or use this feature to saute. You can also bake in this pressure cooker with the multi-cook option. There are more pre-set options on the front panel, you have options for the normal meat, fish, stew and veg but you also have bake and cake with pre-set timings for pizza, egg, yoghurt and jam among others. You have a 6 litre non-stick inner pot to do all your cooking in with a steam tray, spoon and measuring cup. The pressure valve is on the lid which has a twist lock action to seal it. You can use the pre-set times or your own manual timing and any time can be adjusted up or down with the dial on the front. There is also a keep warm function and a delay timer. If you want to deep fry using the fry function you should only do it without using the lid and you can buy a frying basket online. If you are looking for a pressure cooker that can do many things then this might be of interest to you. Read our full review here. We’ve tried to cover a range of pressure cookers to satisfy all requirements so whatever your needs you should be able to see a style that suits you in our Best Electric Pressure Cooker (2018) list. We recommend that you check out Amazon.co.uk, they have competitive prices and when you want to buy they can get it to you quickly. If you still can’t decide why not check out our Best overall pressure cooker. Buy the Instant Pot Duo at Amazon.co.uk and check out the customer reviews too.